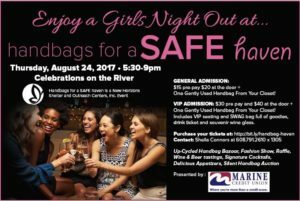 New Horizons Handbags for a SAFE haven presented by Marine Credit Union includes a fashion show, handbag auction, up-cycled handbag mart and raffle. Enjoy delicious cocktails, beer and wine, hors d’oeuvres. Help us provide Shelter for those in need. VIP Seating: $30 advance purchase and (1) gently used handbag; includes VIP seating and VIP swag bag, drink ticket and souvenir wine glass. $40 at the door.